I have created some DIY home automation in the past. This was based around using remote control of mains electrical sockets (Home automation – controlling Energenie power sockets using a Raspberry Pi) but I also used a home automation light on one of my home lights. Since then the number of commercial home automation devices has really took off, so I’m now looking at some other home automation projects. Most are designed for use with Google Home or Amazon Alexa to provide voice activation I’m looking at how they can be integrated into my own DIY projects. I recently bought a SENGLED home automation lighting starter kit. This is a low cost starter kit with two light bulbs (available in B22 UK fitting or E27 European fitting). The total cost including the Hub and light bulbs is comparible to the cost of just the hub with some other manufacturers. One thing about most of the SENGLED products is that they are very easy to install. They are suitable for those that want to automate their house lighting without needing to rewire any wall switches etc. It does limit their usefulness a little as it means they can only be used with standard light fittings, but I can see the attraction of not needing to rewire a light switch. The kits comes with a SENGLED hub. It should be simply a case of connecting this to the router using the supplied cable and then connecting the power. It didn’t work first time for me, which I believe may be due to my home router rather than the hub. I restarted the router and then it worked OK since. To configure the devices you need to download a mobile app called “Sengled Home” App from the Apple App Store / Google Play Store. There doesn’t appear to be anyway of doing this withough a mobile phone (a web client would be useful). The app allows you to allocate the room that each device is in and then turn the lights on/off and adjust their brightness. To add the devices then you need to be connected to the same network as the hub, but then afterwards it is available over the Internet. You can also change the hub to use wireless after setup, but it must be physically plugged into the router for initial setup. You have to relogin to the App on a fairly regular basis. The app is quite basic but does include the ability to change the brightness of the lights, which I don’t appear to be able to do with any other service. Once registered with Sengled you can then register with Google home, Alexa or IFTTT. Using these services then you can turn the lights on and off, but not control the brightness. I think it’s a shame that there is no direct login to the hub. This means that you must register an account with Sengled and optionally with the other services. If they discontinue any of these in future then you could be left with a device that cannot be used. The Sengled hub does not provide any direct access for you to control the lights from a DIY home automation solution. The one thing it does provide is access through IF This Then That (IFTTT). IFTTT is a third party service that allows you to create applets which when triggered cause something to happen. Some of these are predefined, I used one which turns the lights on when I get home. It’s important to note that these don’t run in real time. I found that this particular rule would often trigger after I’d got home and entered the house, which defeated the purpose of what I was trying to achieve. The most useful feature for me is the Maker Event which provides a web address that you can use to trigger actions. These need to be setup individually (one to turn each light on and one to turn each light off). Once created then you can get the URL for each instruction and include that in your own code (eg. using urlopen in Python, or curl to request the page). Unfortunately there is no feedback if that actually works (such as if the light is completely powered off), but it does at least provide the ability to make requests to turn devices on and off. The lights use the ZigBee protocol between the hub and the lights. This is a protocol that has been used by makers for many years, popular with makers and particularly using an Arduino. The problem with this is that there does not appear to be any documentation about the communication with the devices. It is perhaps something that I can investigate in future, but that will involve some element of reverse engineering. The Sengled light bulb starter kit is an easy way to get into home automation. 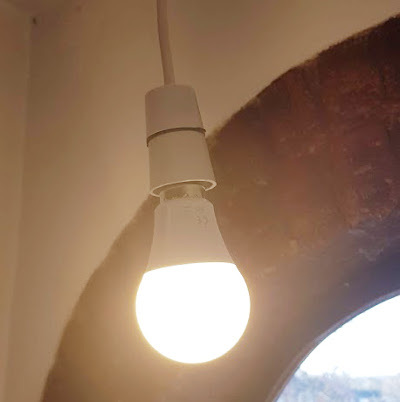 It is a low cost solution that can be connected into a standard light fitting (assuming you have standard light fittings in your home). It works with Alexa, Google Home and can be used with home automation using IFTTT, but with all these they are limited to turning the light on and off, with no feedback of how successful the request is. This entry was posted on Wednesday, April 3rd, 2019 and is filed under Electronics, General, Linux. You can follow any responses to this entry through the RSS 2.0 feed. Both comments and pings are currently closed.